At the World Social Forum!!! Adriana Eslava, from the Columbian Amazon, Coordinator of Réseau Outils de paix. Ferdinand Djayerombe Vaweka, native of the Democratic Republic of Congo and president of Antennes de paix – Pax Christi Montréal, working for human rights, social justice and the transformation of conflicts. The starting question : How to make peace initiatives and peacemakers better known in a media culture centered on sensationalism, scandal and violence? The Round Table is open, please participate! Offer your vote for peace! It is time to nominate people or initiatives for the 2017 Public Peace Prize! The Public Peace Prize is a citizens’ initiative without borders. Its sole goal is to make better known as many peacemakers and peace initiatives as possible. 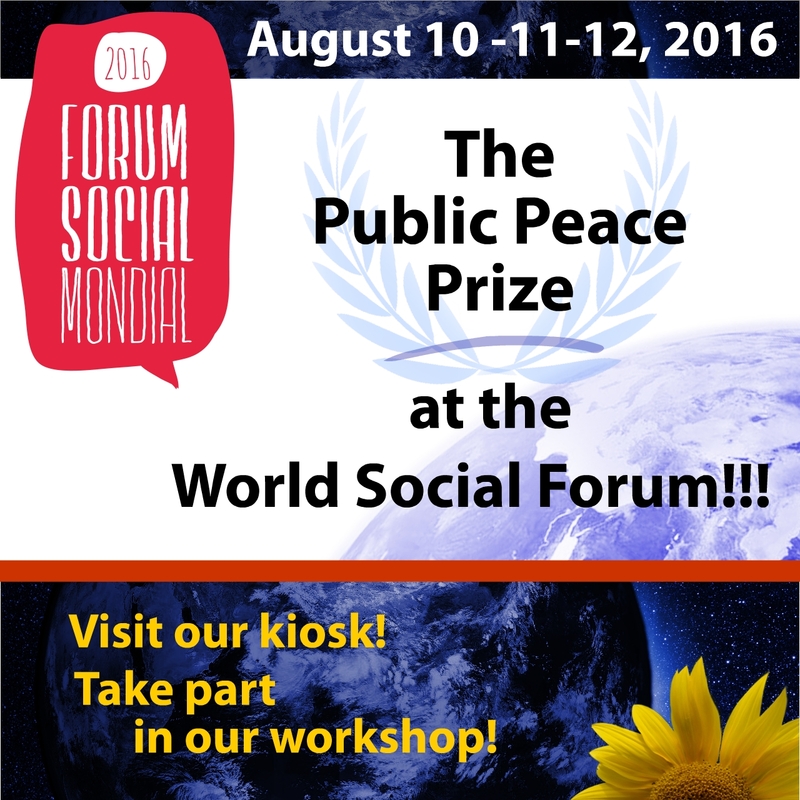 ¡¡¡El Premio del Público por la Paz estará presente en el Foro Social Mundial 2016 en Montreal!!! Visite nuestro kiosco los días 10, 11 y 12 de agosto de 2016 en el Pabellón SH de la UQAM (segundo piso) ubicado en 201 Avenida Président-Kennedy. 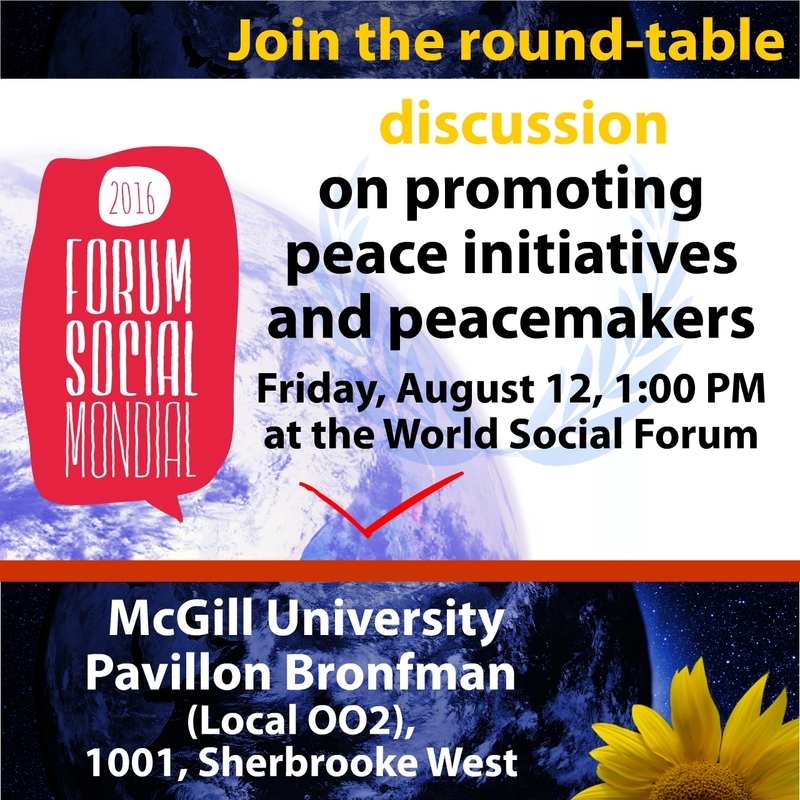 Participe en nuestra mesa redonda que trata de la promoción de iniciativas y de artesanos de paz, el viernes 12 de agosto a la 1:00 de la tarde en el edificio Bronfman de la Universidad McGill (local 002), ubicado en 1001, calle Sherbrooke Ouest. Es el tiempo de proponer el nombre de personas o iniciativas al Premio del Público por la Paz 2017, ¡ofrezca su voz a la paz!